Blades of Steel, much like one of Konami's other NES sports games, Double Dribble, was loved all over the world back in the day. 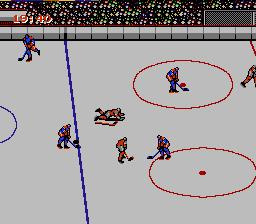 Double Dribble didn't hold up that well, so you may wonder how its ice hockey has fared. Actually, it has aged remarkably well! The game doesn't have detailed "cutscenes" like Double Dribble does (although the sprites are pretty detailed now), but it makes up for this in pretty much every other way. There are now eight teams (four from Canada, four from the US), three difficulty modes, and of course both a single player or two player mode. The game's pretty fast paced, which of course makes for frantic fun as everybody goes for the puck and smashes and trips each other. As in Double Dribble, there is no music during gameplay, but some slightly addictive tunes play at almost every other time. 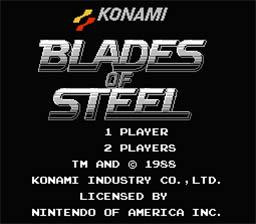 However, as with most other later NES games, there is a small amount of sampled speech. If a player bumps into another player enough times, chaos will ensue as you enter a small fighting minigame akin to Urban Champion where you try to beat up the other player before he beats you. The loser gets sent to the penalty box! During the second intermission, there is about a 50% chance that you get to play a little minigame based on Gradius (Which is by Konami, of course!). This provides a fun break from the action and is pretty nifty (Konami sure love to stuff Gradius into their other games as a minigame). What else is there to say? 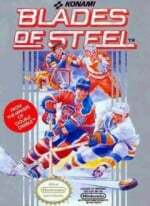 Overall Blades of Steel is better than Nintendo's appropriately titled Ice Hockey, and it's held up pretty well compared to Double Dribble. If you liked the game back then or like ice hockey games then this would not be a bad download. Sounds decent, but i hope it controls alright.